Can the Paltans' continue their unbeaten run? In the second of the doubleheader scheduled for the day, the Puneri Paltan will take on Dabang Delhi at the Motilal Nehru School of Sports, Sonepat. Puneri Paltan is coming off a well-deserved win in their last match against the Haryana Steelers, and would look to build on a winning streak against the Dabang Delhi. The raiding contingent looks more or less set with all three raiders - Nitin Tomar, G.B.More and Deepak Kumar Dahiya contributing to the scoreline in their last match. Rajesh Mondal's lack of form is the only issue from the raiding contingent that needs to be addressed. The defense of the Paltans has been working well together, with the covers Sandeep Narwal and Ravi Kumar providing effective and timely assistance to the corner duo of Girish Ernak and Sandeep. 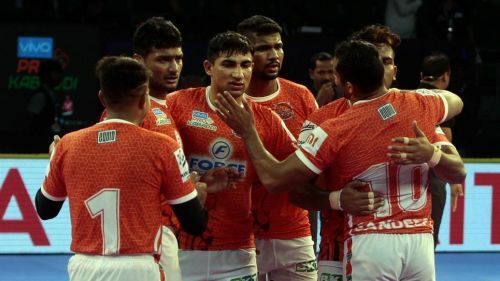 The Dabangs' on the other hand, were a defensive disaster in the first half of their match against the Fortunegiants', but critical substitutions and better coordination helped them to hold on to the match by the skin of their teeth. They wouldn't repeat the mistake of not starting the game with Chandran Ranjit, who turned out to be their best raider scoring nine points (seven touches and two bonus points), after coming off the substitution bench. The substitution of Meraj Sheyk in the 12th minute of the game was a highly contentious decision. While Meraj may not give the team raid points on a regular basis, but when the going gets tough, he is the man who can give those crucial multi-point Super Raids, as he has done repeatedly in the past seasons. When and where to watch: 21.00 IST on the Star Sports network and on the digital streaming platform, Hotstar.